We arrived in Aruba after a day at sea so I think everyone was feeling a little more recharged and ready to explore once again. The cruise port was a hive of activity as there were 5 ships in port including us so it was a little crazy for a few minutes trying to navigate your way around several thousand people and then buses that were going back and forth. Aruba felt very americanised, it didn’t quite have the same feel as the other Caribbean islands had up to now but it was still very nice. There were shops and bars as far as the eye could see but we had a better plan for Aruba. We wanted to see Eagle Beach! Eagle Beach is voted as one of the world’s top 10 beaches and this we had to see. We jumped in a cab which took us to the hotel Café Del Mar. The cab driver said walk through and you will be on the beach, so we did. The hotel complex was nice too as was the surrounding area! I made sure I had a good spy around before heading through and onto what I can only describe as the most gorgeous beach I have ever seen, it really was stunning! We had planned to visit here before we left for the cruise but a beach day was not on the cards. I actually burned my legs quite nicely in Grenada so walking across the sand with it sticking was not the nicest of experiences I must admit. I done it but was glad of the fresh water tap just off the beach to rinse my legs! 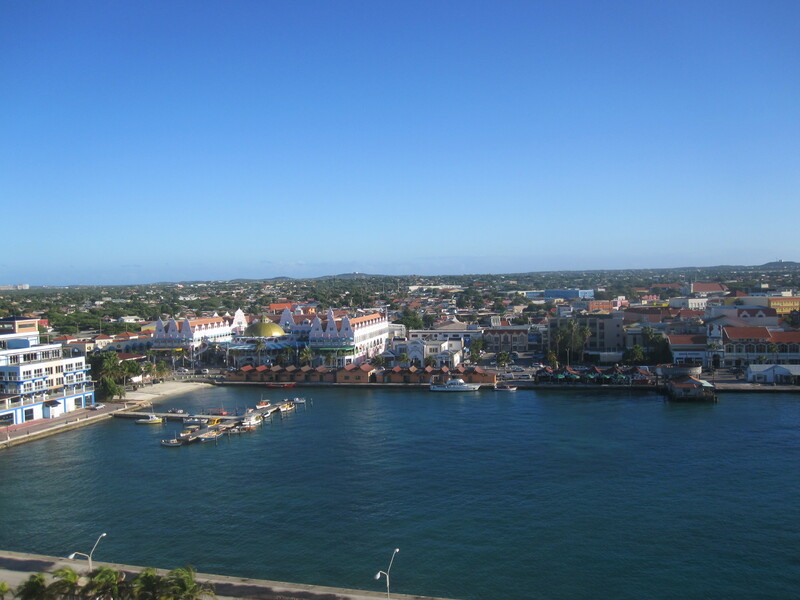 We walked as far as the Sandals resort then turned and decided we would stop at Matthew’s bar for some food and to enjoy the fact we had such a beautiful view for the morning. The bar was lovely, there were little birds flying in and out, we could see two Pelicans diving for fish from where we were sitting and there were a few Lizards lurking around too. 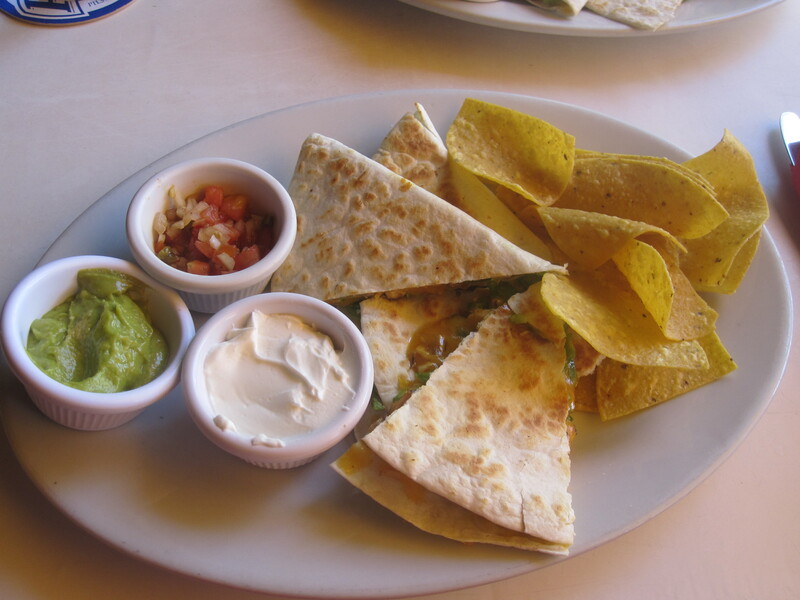 The food was delicious, my first taste of authentic Quesadillas and I was not disappointed. We savoured every single moment and I sat green with envy at the people who were enjoying the clear blue and calm waters of this breathtaking location. Really, I was jealous because I had been an idiot in Grenada and now I was paying for my sunshine sins in the brightest shade of red. There were numerous hotels all along the beach and the Aruba Beach Club hotel was next door to where we were, we had a quick walk through there and that too was very nice. Across the street we found a shopping arcade, there were a few clothing stores, beach stores and a supermarket so an ideal complex really for a longer trip. I also want to mention that you could walk to Eagle Beach if you are fit. We opted for a taxi though as it is quite some distance away from the port especially in the heat of the sun! As we waited for our taxi back into Oranjestad we were caught quite off guard by the sight of a dog running down the street with the biggest Iguana in its mouth I have ever seen! The reptile sadly was clearly dead but it’s not the kind of thing you see every day in England. Maybe a cat with a bird but a dog with an Iguana that was about the same size as it! 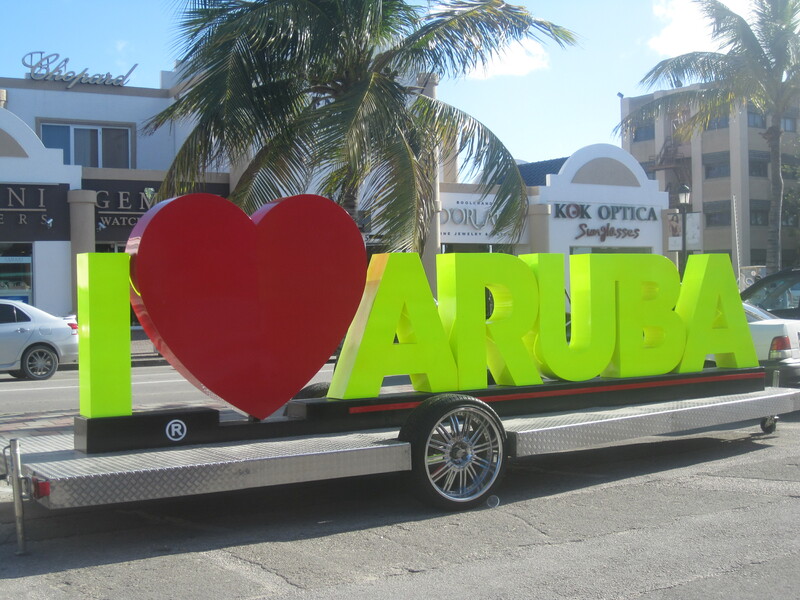 Aruba did seem to be a shopping port for a lot of people. There was a nice little market directly outside the cruise port entrance, you couldn’t miss it. There were also a lot of larger stores, designer stores including Louis Vuitton and then there were a selection of supermarkets. Everything you could want really. 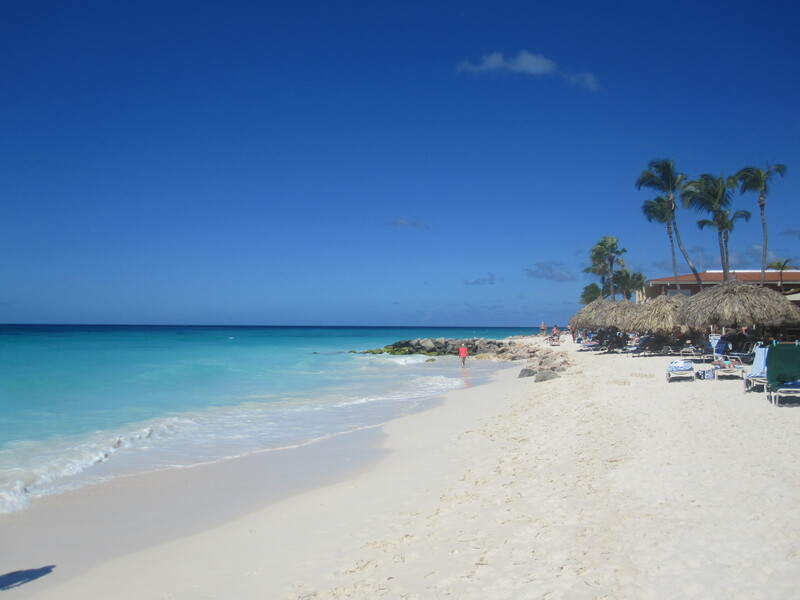 I thoroughly enjoyed Aruba, I was disappointed that it really had no Caribbean feel to it but, overall it was a nice place to visit and the beach alone made the call stand out in my mind. Next time…..I shall be there all day and I WILL swim!! Sunset Cruise in Aruba with jolly pirates is most popular. You will going to enjoy the sunset cruise with your family and friends. You can enjoy the snorkeling and deep sea diving with the expertise of Jolly pirates.